When test designers struggle to use Hexawise, the most common reason is identifying what test inputs should be included in the "Inputs" screen. To help address this challenge, this lesson describes several categories of variables that are often useful to include in software tests. At the risk of stating the obvious, you'll need to use your judgment here; not all of these categories will be necessary (or even useful!) to include in all of your sets of tests. Variables for software tests can be described in these general categories. It is important to remember that when you're entering variables into the "Inputs" screen, you should include test inputs only. You should not include outcomes or expected results. Environmental variations relate to different potential combinations of hardware and software that people might use, as well as the different locations of data that might be pulled from when a given transaction is executed. Imagine you're creating some end-to-end tests for a flight reservation system, like hipmunk.com (a site widely praised for its exceptional User Interface). As a web application, you would probably want to include multiple combinations of hardware and software configurations. User Variations relate to how different people might navigate through the System Under Test based on their particular habits as computer users. They can also include, as in the case of an "Admin User" with special rights, the particular features of the system that they have available to them based on the kind of user that they are. 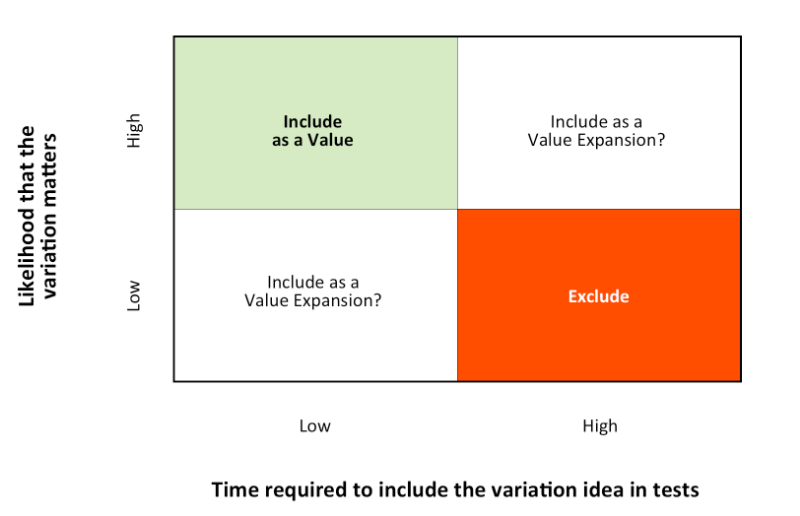 Usage Variations relate to what different features of a system people might use, as well as how they might use those features, and the different types of data that might be used in different scenarios. "Hendrickson Variables" offer a great checklist to tick through as you think about possible variables to add. Elisabeth Hendrickson published "Explore It!" in 2013. In our opinion, it is one of the best software testing books ever written. We highly recommend it to new and experienced software testers alike without reservations. It's available for purchase through PragProg and Amazon. Chapter 4, titled "Finding Interesting Things to Vary," is particularly outstanding. The chapter does a superb job of articulating not only what kinds of variables you can change from test to test but also why it is such a good idea to vary them. These "Hendrickson Variables" come from Chapter 4 of "Explore It!" Deciding whether to include a specific test idea often comes down to a judgment call by the test designer using Hexawise. INCLUDE - If you have reason to believe that including a test input is likely to matter and it would not take much extra time to vary that idea in each of the tests in your test set, then include it. An example: if you're testing a transactional web application and prior releases have had quite a few defects associated with the IE10 browser, include "Browser Type" as a Parameter and "IE10" as one of your Values. EXCLUDE - Conversely, if you suspect that a particular test idea is not going to make any difference and that variation would take considerable time to include in each of your tests, then do not enter those into the "Inputs" screen of Hexawise. An example: as pointed out by James Bach, defects have been triggered by blocked cooling vents above servers on extremely rare occasions . This caused a server to overheat. Even so, it would rarely be sensible to invest the time necessary to test out multiple test scenarios with overheated servers on a given set of tests. Including test ideas using the Value Expansion feature allows for quick testing without wasting time (over testing). An example: imagine that you're testing a new feature of a financial transaction application. It will be used for foreign or domestic transactions. Setting up the testing environment for each foreign transaction requires dramatically more time than for domestic transactions. If you were to include "Type of Transaction" as a Parameter and use "Domestic" and "International" as the 2 Values for that Parameter, approximately 50% of your tests would be international transactions which would each require a great deal of extra setup time. In such situations, you might instead consider using "Type of Transaction" as a Value and then adding "Domestic, International, Domestic, Domestic, Domestic, Domestic, Domestic" as sub-values when you create your Value Expansion. Using this test design technique would result in at least one "International" transaction (for coverage of this potentially important scenario) but you would avoid spending too much time "over-testing" the idea. When you're first getting started, feel free to experiment! You will often find surprising defects when you add variation to your tests, yet adding the variation to your tests often hardly takes any time at all. Adding a Parameter with a few Values takes only a few seconds on the "Inputs" screen of Hexawise. Finally, unlike when you select and document tests by hand, generating the tests with the newly-added test ideas won't add noticeably more test documentation time; the tests generated by Hexawise will all automatically include that test idea. Provided you keep the number of Values per Parameter small, you usually won't increase the number of tests that Hexawise will generate.